We are happy to share with you the second edition of the Smart Mature Resilience newsletter. This newsletter is circulated quarterly with the latest project results, updates on project activities in cities and the latest news on critical infrastructure protection and city resilience. In their role as peer-reviewers (‘critical friends’), the Tier 2 cities will closely observe the process of tools testing in the pilot cities, evaluate the implementation, provide advice and learn in partnership with their pilot city. Pilot implementation of project tools was launched for partner city of Donostia/San Sebastián on 13 April 2016 at a kick-off workshop in the project coordinating institution of Tecnun. According to Diario de Noticias de Gipuzkoa, Mayor of Donostia, Eneko Goia opened the meeting, noting that Donostia faces “two risks associated with the global phenomenon of climate change that test the resilience of the city itself: these are the sea and the river.” He further noted the importance of the event in Tecnun, as it represents the launch of the testing phase of pilot tools of the Smart Mature Resilience project. Early stage pilot testing of the SMR tools has been ongoing since the first launch in February 2016 in Kristiansand (Norway) with a workshop focusing on the water and sewage security sector. This continued on 13 April in Donostia, where the main focus of the workshop dealt with communication flows in the energy and telecommunication security sector, particularly in emergency situations. The next launch of tools testing will take place in Glasgow. The further four project cities (Bristol, Vejle, Rome and Riga) will closely observe the testing process, learn alongside the pilot cities and provide feedback on the project tools via webinars. SMR project partners attended the Kristiansand annual conference for emergency management, which gathered over 200 emergency stakeholders in the Agder region. Picture from left to right: Torbjørg Træland Meum, Jaziar Radianti, Mihoko Sakurai (UiA), Silje Solvang, Sigurd Paulsen (City of Kristiansand), Tim A. Majchrzak (UiA). Experts from all seven SMR cities met to exchange information and knowledge related to the risks associated to Climate Change and to provide material for the development of the Resilience Management guidelines in Bristol, UK from 25th to 28th January 2016 at the SMR project’s second workshop, which focused on policies, indicators and barriers associated to Climate Change. The third workshop of the SMR (Smart Mature Resilience) project in Rome (Italy) from 22nd to 25th February 2016 focused on policies, indicators and barriers associated to Social Dynamics. Project scientists have recently produced the SMR City Framework (SCF): a theoretical perspective on city resilience in a municipality context based on contemporary theories in Resilience Engineering. Linköping University’s recent Multidisciplinary Literature Synthesis also translates the SCF into a set of concrete actions for city managers. Project researchers have also compiled systemic literature reviews of urban resilience in a global and EU context as well as surveying the current policies and challenges directly relevant to the SMR partner cities in the Survey Report on Worldwide Approaches and the Survey Report on EU-Sectoral Approaches. 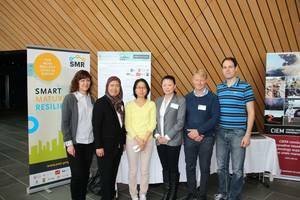 The Smart Mature Resilience project met in Vejle from 9-12 May 2016 to proceed with validation of the tools under development by the project: the maturity model, the systemic risk assessment questionnaire and the engagement tool. The cities share their experience as part of the Circle of Sharing and Learning as to their progress through the various stages of resilience development by presenting their experiences and best practices in Vejle and also as part of 2-tier webinars. The Government and Disaster Resilience minitrack invites papers that deal with any aspect of the analysis, design, development, deployment, implementation, integration, operation, use or evaluation of ICT for discussing government roles for disaster resilience. The peer reviewing process by the cites of Bristol, Riga, Roma and Vejle will be led through specialised webinars for each city. The first webinar will be held in May 2016 between Kristiansand and Vejle and will focus on the Community Engagement Tool. This free event for local governments, urban green infrastructure practitioners, researchers and private sector stakeholders will showcase examples from London, Strasbourg and the Parkstad-Limburg Region of how local governments can work with the private sector to make urban development in their cities greener. SMR will be presented at the 8th European Conference on Sustainable Cities and Towns as part of a poster exhibition at the Innovation Market on Thursday 28 April.